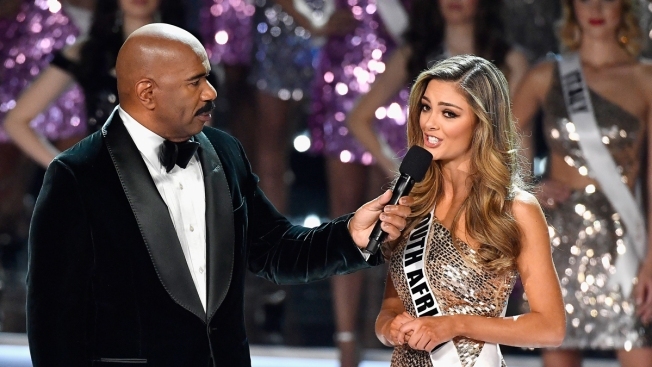 Miss Universe host Steve Harvey speaks with Miss South Africa 2017, Demi-Leigh Nel-Peters, after she was named a top 16 finalist at The Axis at Planet Hollywood Resort & Casino in Las Vegas on Nov. 26, 2017. "HIV/AIDS is a very big problem in my country South Africa, so I hope to stand as an advocate for that," she said after the event. Grammy-Award winner Fergie performed her new song "A Little Work" while the contestants walked down the stage wearing evening gowns. This year's judges included YouTube star Lele Pons, former judge of "America's Next Top Model" Jay Manuel and Wendy Fitzwilliam, the 1998 Miss Universe winner from Trinidad and Tobago. Donald Trump formerly co-owned The Miss Universe Organization with NBCUniversal (which owns this station). But the network and the Spanish-language broadcaster Univision quickly cut ties with him in 2015, when he offended Hispanics with anti-immigrant remarks in announcing his bid for the White House. Trump sued both networks, eventually settling and selling off the entire pageant to talent management company WME/IMG.